Years of Friendship, Knowledge and Support...Purchasing a new Bernina from our store gives you complementary membership (Part of our RSC Happy Sewing Guaranteed Program) in our famous Traditional Bernina Club. This monthly meeting of our passionate Bernina sewing machine owners will take your interest in sewing, embroidery, and quilting to a whole new level. You will learn new techniques and see lots of fun new projects. You will be the first to see products and ideas to make your sewing easier and more creative. Bring your latest project to share with the club... and you will be inspired by all the ideas other members provide. This "Sew-n-Tell" time is a hallmark of our Traditional Club. We will also keep you up to date on upcomming events and classes. Each Club is about 1-1 1/2 Hours long. Don't miss the FUN! 2019 Saturday Morning Bernina Club Dates: 5/4, 6/1 at 9:30am. "Meeting new Friends along your Sewing journey is one of it's greatest pleasures..."
Come and Learn to use your Bernina V8 Software to expand your embroidery machine FUN. Live or Pre recorded Software Project demonstration. You will recevie project materials at each meeting. Please bring a USB stick. Each Club is about 1-1 1/2 Hours long. Don't miss the FUN! 2019 Saturday Morning Bernina Software Club Dates: 4/20, 5/18 at 9:30am. Special Events are Always happening at Rogers Sewing Center. Just ask...There is ALWAYS Something FUN to attend! 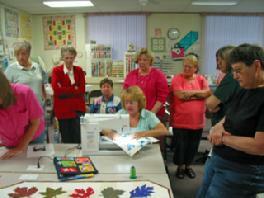 This local sewing group normally meets the 2nd Saturday of each month at 9:30am. They invite anyone to come and join the fun. Bring your lunch and your current project. Visit and see what everyone has been doing. New products. Lots of fun. We provide drinks. Meets most Thursdays at noon.